M&A activity year to date, driven by healthcare, pharmaceuticals, and telecommunications, has already topped $1 trillion. More billion-dollar deals were announced Monday in the healthcare and telecommunications sectors, as well as lucrative transactions in oil and tech. Here's a roundup of Monday's deals, and what they mean for the buyers and their respective industries. Level 3 Communications Inc. (NYSE: LVLT) has agreed to buy TW Telecom Inc. (Nasdaq: TWTC) for roughly $5.68 billion, as consolidation in the telecommunications industry continues. TWTC shareholders will receive $10 a share in cash and 0.7 LVLT shares for each TWTC share held. 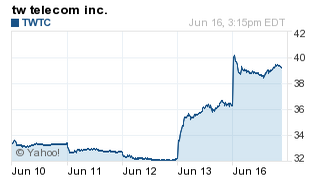 That's worth about $40.86 a share, a 12% premium above TWTC's closing price on Friday. In acquiring TWTC, Level 3 gets a prominent player in network services, particularly Internet access and online-based voice calling to businesses. Indeed, TWTC posted $36.5 million in profit in 2013 on revenue of $1.6 billion. The buy also makes LVLT a stronger rival to AT&T Inc. (NYSE: T) and Verizon Communications Inc. (NYSE: VZ) in business and Internet services. LVLT expects the deal to generate about $240 million in cost savings. TWTC shares surged nearly 10% to a 52-week high of $40.51 intraday. After trading as high as $44.70, just shy of its 52-week high of $44.44, LVLT shares slipped 5.74% to $41.56 in afternoon trading. M&A activity in the telecom industry has caused some of the biggest deals of 2014, as companies vie for a bigger scale. Comcast Corp. (NYSE: CMCSA) has agreed to buy Time Warner Cable Inc. (NYSE: TWC) for $45.2 billion. AT&T Inc. (NYSE: T) is looking to take over DirecTV (Nasdaq: DTV) in a deal worth $67.1 billion. And, Sprint Corp. (NYSE: S) and T-Mobile USA (NYSE: TMUS) are mulling a merger. The Wall Street Journal says more deals are likely as small TV channels are gobbled up. Yet, the most logical deal in the sector might be for CBS Corp. (NYSE: CBS) to merge with its former sister company Viacom Inc. (Nasdaq: VIA), according to The Journal.